« Why is the push for Mobility high in Healthcare? The universal adoption of Electronic Health Records in a Meaningful way is the backbone on which all Healthcare reforms are hinged. Based on figures shared by HHS, incentive payments under the Medicare and Medicaid Meaningful Use programs have reached more than half of all eligible professionals, and 80 percent of eligible hospitals. Expected to be responsible for better healthcare outcomes, it is the implementation which has been the cause of a lot of bane. Apart from the operational changes that are required to be brought in, the whole process takes a lot of financial toll on healthcare setups. There is infact a strong belief which is gaining ground that the net cost outweighs the benefits of using an EHR. The independent physicians rather than the employed physicians are more likely to hold this view. Another complaint held by the physicians’ fraternity is that the EHRs have been built without keeping their requirements in mind. Some physicians have actually gone to the extent to build EHR products to exactly suit their clinical requirements and also to handle the common issues they otherwise face in using the standard products available. But do physicians actually have the know-how to design EHR Systems? The answer to this question is not a simple one. At the end of the day, EHR systems are used by physicians and so, they are in a position to share the real-time issues which crop up during usage. But because they face issues in say handling certain features or are in the business of providing care it does not automatically qualify them to build new healthcare IT systems for many reasons. For e.g. Some of the features which they otherwise find troublesome or, even worse, as stumbling blocks to their normal flow of work might actually be highly essential ones; identified and implemented in the system based on industry based practices. There is a high possibility of the complaints having arisen because of the inconvenience of physicians in adapting to a new workflow more than anything else. As a solution, some of the physicians have been recommended to go the open source way in which they get in touch with Health IT experts and take their help them to make changes in standard EHR systems to meet their requirements keeping in mind adherence to the Meaningful Use criteria all-throughout. The market for EHR adoption was $20 billion in 2012 and is expected to grow in the coming 2 years. 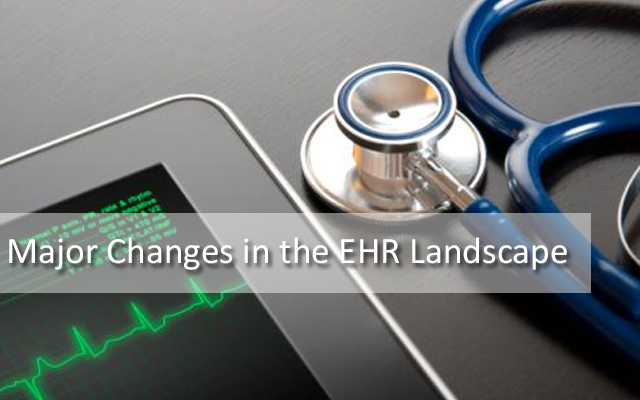 However, the market of EHRs is likely to undergo some major change this year. Federal push for Meaningful Use led to a race among HealthCare software development vendors to create standard EHR products. They did not initially bother to customize their systems to meet the requirements of individual setups. Over a period of time this approach led to various complaints to the vendors. However, with the focus of the vendors more towards selling their products and reaching out to more clients, severe issues pertaining to implementation, support and specialty features, to name a few, started talking a toll on the performance of healthcare setups . This tolerance has reached a boiling point in 2013 with healthcare setups actively looking to switch over to EHR systems offered by vendors who were willing to address their concerns on an ongoing basis. For the vendors, the short-term revenue growth was triggered mainly by the Federal stimulus. For a sustained long-term market they will be required to focus their energies on usability and interoperability. A survey done across industry experts reflected that eventually most of the EHR vendors are likely to acquired, merged or thrown out of business ; simply because most of them were targeted at the retail mass. As high cost of implementation independent practices are expected to merge with larger setups i.e. hospitals. This is bound to have an impact on the number of vendors in business. Pressed by deadlines hospitals will be compelled to quickly look out for vendors which provide an integrated platform with stable functionalities to ensure ease of use and interoperability across affiliated physicians. Thus the times ahead auger well for those EHR vendors which provide holistic and easily customizable systems and are quick to resolve issues which their clients face. We provide Healthcare application development and HealthCare application testing services. If you would like to talk to one of our software testers or one of our certified Healthcare software developers, please get in touch with us at Mindfire Solutions. This Post was posted in Health Care and tagged Clinical software development, Customize EHR system, customized cpoe systems, develop ambulatory ehr ssolutions, develop ambulatory healthcare system, develop clinical information management systems, develop computerized physician order systems, Develop Electronic Health Records, Develop Electronic Medical Records, develop hipaa compliant patient portals, develop hospital management system, develop medical e-learning solutions, develop medical information system, emr software developers, healthcare mobile app development, healthcare software integration, healthcare software maintenance, internet-based medical billing software development, iphone healthcare app development, iphone medical app developers, Medical Software development, mobile health app development, mobile healthcare application development, outsource mhealth development. Bookmark the permalink.